We are pleased to welcome this guest post by Emil Erjavec, Professor of Agricultural Economics, Policy and Law at the University of Ljubljana, Slovenia. It is a version of his keynote speech to be delivered at the “The future of the CAP – L’avenir de la PAC” conference organised by Société Française d’Économie Rurale at Montpellier Supagro on 22 June 2018. In December 2017, the European Commission published a Communication announcing a new round of important changes to the CAP post-2020; its legislative proposals, published June 1st 2018, have officially initiated it. Whether these changes are truly far-reaching and whether they contribute to a more efficient, effective and less controversial policy, will largely depend on the result of inter-institutional negotiations and later national implementation. Nevertheless, the basic building blocks of reform are known. I agree with those who point out that this reform is primarily about changes in the institutional approach and responsibility of agricultural policy and less about changes in available policy instruments. The public debate over the past six months in social media, at numerous conferences, as well as reactions in the Council and European Parliament, show that the key issues of the future CAP are: i) the reduction of resources (significantly larger for rural development than for direct payments), ii) the further stronger inclusion of societal considerations with a more pronounced environmental orientation, iii) the introduction of degressivity and capping of direct payments for larger farms, and of course iv) the new CAP implementation model, which has become known as “CAP strategic planning” for EU-funded agricultural policy measures. Considering the first reactions to these issues (Agra-Facts, 2018/45), it is becoming clear that the key points of negotiation in EU institutions will be the amount of funds, the capping for agricultural holdings and the environmental focus of future policy. Given past experience and the farm interest-based nature of decision-making in the European Parliament COMAGRI and Council of the EU, the final outcome of the negotiations can be expected to be a weakening of the Commission’s proposals, which will nevertheless preserve the indicated direction. Strategic planning – a serious evolutionary shift in the CAP? Many commentators see comprehensive strategic planning at the Member State (MS) level as the crucial element of the proposal. Due to its technical nature, the current proposal does not directly favour anybody. While it can be expected that the political process will morph it significantly, the new fundamental principle and shift in policymaking will likely remain the same. The legislative proposals are clear: while previously strategic planning was a requirement at the EU level, though frankly more a justification of political decisions made beforehand and toothless in the case of policy failure, its transfer to MSs turns a new page in CAP history. The proposed Regulation (COM (2018) 392) unequivocally states that policy will have to be formed following a comprehensive intervention logic; this includes programming of measures and a more rigorous application of the policy cycle concept. This entails founding policy on societally identified and recognised needs for intervention, deriving objectives and indicators (at all levels of evaluation) from these, and selecting the best available measures that can effectively contribute towards reaching the set targets. If effects are insufficient and there are no other known objective causes for this, measures should be accordingly modified. This logic is not in itself under question, as it is supposedly the foundation of modern public policy governance; the key question is how consequentially it will be applied in the real world and whether it will bring about a more effective policy. There are fears that, similarly to ‘Greening’ in the previous reform, strategic planning is simply a new pretext to preserve the redistribution approach of the CAP, with at best marginal changes in its functioning and effects. From the political economy point of view that takes into account the interconnectedness of vested interests in agricultural policy decision making, one of the key questions for representatives of mainstream agricultural governmental and non-governmental organisations is the amount of funding that will still be available for the CAP, coupled with how many ‘new’ demands will be placed on farming. 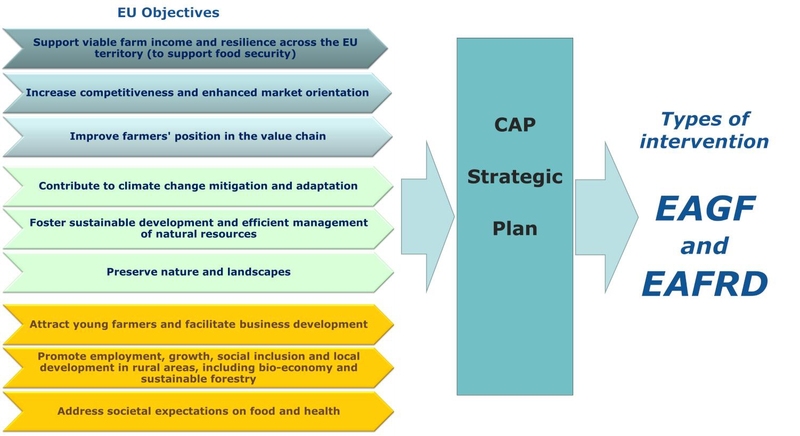 From an analytical point of view, as well as in the view of numerous environmental interest groups, however, applying national strategic planning to the entire CAP (this was already done for Rural Development policy in previous periods) certainly represents the greatest novelty and merits careful consideration and debate. Will there be minimal requirements for Member States for real CAP reform changes? What kind of obstacles and risks can be expected when implementing the strategic logic at national level? In this post, we attempt to elucidate the substantive part of strategic planning given the current array of measures and indicators, i.e. analyse to which extent institutional structures, actors and procedural rules allow for quality strategic planning resulting in a more efficient (in terms of the effect/resource ratio) and effective (in terms of achieving goals) agricultural policy. The proposed concept of strategic planning is based on the policy intervention framework at the EU level and CAP Strategic Plans at the level of individual MSs. There are 9 specific objectives that are derived from the three pillars of sustainability (see figure). They in turn are the basis from which derive indicators and broadly defined interventions, i.e., general descriptions of measures to achieve the objectives. MSs will have to identify and determine their own needs for intervention and, in accordance with targets set out at the EU level, select, justify and elaborate measures from the given set of instruments. The European Commission will approve the CAP plans and monitor their results in accordance with the set objectives and indicators. The essence of any strategic planning is defining needs (problem state) and policy objectives (desired state) based on those needs. The performance of policy management depends on how well this is done. The definition of needs should also determine and reflect the priorities of the decision-maker. We claim that it is precisely this element that is the weakest link of the CAP (and all agricultural policies). It originates primarily in the interest-based nature of the policy. Agricultural policy has long since solved Europe’s post-WWII problems with food security (even famine), which was the original reason for its existence; ever since, it has largely been an income policy, solving the question of farmers’ economic situation. Yet it is not at all clear which groups of agricultural holdings are being targeted (all/large/small), what their sources of income are supposed to be and which production and economic activity they are supposed to be engaged in. At least at the EU level, policy documents have never allowed for a precise definition of these elements for different reasons, ranging from objective problems with fragmented farm ownership and specificities in agricultural taxation to political charades. Anybody engaged in thorough agricultural policy analysis knows that in the majority of MSs, there is a lack of precise information regarding the economic and income status of rural households. Thus, the image of the economic situation and the influence of agricultural policy on this situation is quite blurred, as are agricultural policy priorities. How can there be clear goals and targeted measures if there is no clear image regarding the crucial question that they are addressing? For decades, support mechanisms have been changed, adjusted and renamed, yet still the majority of budgetary transfers reach the same type and size of producers. Caught in a clinch of particular interests of individual MSs and interest groups, policymakers at the EU level have not been able to untangle this Gordian knot. Will is lacking, as is (not unrelatedly) factual information regarding the situation; meanwhile, structural change is treading a path of its own, while the majority of support is handed to those who should not receive it if objective economic criteria were applied. We can therefore no longer speak of an income policy, but of one of societal redistribution; one that, due to its mainly area-based measures, favours the largest, and as a rule most influential and organized beneficiaries. Naturally, the Commission recognizes this problem and is attempting to address it with its proposals (capping, complementary redistributive income payment, attention to small farms), but it does not do away with agricultural policy’s original sin of the mainly non-targeted income support favouring larger land owners and producers. The legislative proposal throws this hot coal in MS’s laps, where heterogeneity in clarity of vision regarding priorities and quality of data sources for policy planning and monitoring is even bigger. Considering the conditions in individual countries, it is likely that an important share of member states will not know where to put this Commission ‘gift’ and will probably attempt to maintain the status quo, adapting only to compulsory new demands. The European Commission has played its part in obstructing serious strategic thinking. Due to internal (path dependency mentality) and international (WTO rules) political and administrative reasons, the two-pillar structure lingers; yet the form and amount of direct payments (per area payments with top-ups and very open conditionality) leave little room, if any, for serious income, let alone social, policy to take place. Naturally, the key question is actually how to clearly define needs without incurring the wrath of some interest groups. In a period of rampant populism and pragmatism, including that of European governments, no decisive moves are to be expected in the majority of MSs, as such moves bring no political points. On the contrary, they introduce additional conflict into a political field that is, in the end, not that important in the general political context; it is simply about who gets how much money and for what. Heretical suggestions, like a universal basic income for workers in agriculture that could improve the economic situation of the most vulnerable and have both territorial and social effects in rural areas, are of course out of the question. Better to adhere to area-based politics supporting everything from “income stability” to “competitiveness”. Even discussing different income policy measures would be a loud and clear statement that the agricultural policy of the past few decades has been little more than a thinly veiled, poorly executed substitute for a serious social policy, its good intentions additionally twisted by particular interests; and clear statements seem outside of the remit of current agricultural policy discourse. Another fundamental field where the deficiencies of the CAP’s strategic logic become prominent is of course environmental protection and conservation. The increasing inclusion of environmental considerations into agricultural policy is a reflection of its attempts to be more societally relevant. This is in stark opposition to its scope in the past, when agricultural policy was strictly sectoral, in the domain of agricultural ministries and interest representatives. At the EU level, environmental concerns are clearly stated. Many commentators, especially representatives of environmental organizations, criticize the policy for exploiting this (legitimate) societal concern to maintain the size of the agricultural budget and thus the political power of the agricultural sector. The Commission is forced to navigate the waters between the Scylla of agricultural income politics and the Charybdis of environmentalists’ invocation of widespread destruction of nature due to agricultural practices. Perhaps the European Commission could be more decisive: it is a large ship it is steering towards change, not a rubber boat. Unfortunately, environmental protection is not exempt from a lack of clear identification of needs. While perhaps in this field the quality of indicators exceeds that of the field income needs, the main challenge of this policy lies in deficiencies knowing the real situation and in understanding agriculture’s concrete effects on nature and the environment, and especially in setting environmental priorities in agriculture. In a considerable number, if not in all MSs, decision-makers and agricultural pressure groups consider environmental priorities to be a necessary evil, imposed by Brussels under the influence of (irrational) environmentalists. Most agricultural administration and decision-making is, at least in the East and South, still permeated by productivist logic; they are not convinced by such arguments, but view them as superfluous administrative constraints. This conflict will likely not be resolved with strategic planning at the national level, at least in most administrations. Rather, the rift will deepen. In many countries, incentives to conduct a serious environmental policy will be weakened with the transfer of strategic planning to the national level. This pitfall is apparently recognized by the Commission, likely due to the influence of DG Environment, as it is introducing safeguards, such as minimal compulsory percentages of funds allocated to environmental protection and a new green architecture (the eco-scheme). Naturally, this is opposed by some MSs, who demand less stringent environmental conditioning. To be frank, this does significantly constrain strategic planning and enforces Brussels’ dictate. We could also discuss other priorities of agricultural policy highlighted in the proposals and point out the weaknesses in the explanation of needs, choice of mechanisms and thus potential for serious application of intervention logic in MS strategic plans. Risk management, rural employment and poverty, the role of knowledge and the increasingly societally relevant issue of agriculture and food, are more touched upon than strategically determined, as opposed to the two fundamental fields mentioned above. Moreover, in most of these fields, the evidence base available for planning and evaluation is quite weak. The extent to which MSs consider these priorities is left to them, but they are certainly fated to be marginal topics. With perhaps some exceptions, MSs are not likely to address these societally relevant topics (food, employment, poverty), nor to apply systemic tools (knowledge, risk management) to bring about change; most countries neglect these topics due to their entanglement in redistribution logic. It is difficult to ignore the impression that the Commission only addressed these topics to free itself of responsibility for them in the sense of ‘We know these are important topics, here are some tools, now you deal with them.’ MSs will probably follow suit: invoke these issues and their importance to justify the policy and then blame a lack of (and even decreased) funding for their ‘inability’ to address them. In some MSs, this is already taking place. Hopefully this kind of behaviour will not be applied by all states; perhaps there will be a breakthrough for some topics. There are additional obstacles to future strategic planning of the CAP. We may expect the new approach to widen the East(South)/West(North) divide. Agricultural policy discourses and their understanding are quite different. They are influenced by objective historical, structural and economic differences in the agriculture and rural areas in different parts of the Union. These differences have not yet been adequately recognized by the EU decision makers. Measures to compensate for the lagging economic development of the agriculture of the East(South) states behind the West(North) have only been partially successful. Moreover, the CAP is unable to address rural (un)employment, depopulation and poverty in the East(South). The developmental needs here are different and the implementation of the CAP so far has been administratively and financially too demanding to benefit the majority of the rural population, with the exception of rural elites with the capacity to acquire extensive EU funding. This is of course a harsh statement based on the author’s personal experience and difficult to prove, owing to a lack of good records. While tackling strategic planning will not be a simple task for any administration, agricultural policy-makers in the East (South) of Europe could have difficulty recognizing the nature and causes of the issues they face and addressing complexity to change the situation. And while there may be good intentions on the Commission’s part to allow MSs as those best acquainted with their own needs to deal with them in their own way, the involvement of political elites in interest-based redistribution is too obvious for the author to be optimistic about the results of this process. The scope of strategic planning is also crucially dependent on the programmers and administrators of agricultural policy. Implementation is in the hands of state and regional bureaucracies, which have until now been strongly engaged in meeting Brussels’ demands, living in fear of audits and low absorption of funds. Though differences between parts of the EU in the quality and functioning of administrations are enormous, certain challenges are common. Even a quick review of Rural Development Programmes, which must already now be planned using strategic thinking, indicate not only large differences in quality, but ensnarement in a bureaucratic, emulating logic, path dependency and a distribution of funds based on political interests. Strategic planning is supposed to be a creative, intellectual and democratic endeavour, which requires excellent staff and a comprehensive approach. Will civil servants in MSs be up to the challenge? The common, populistic practice of asking stakeholders what kind of measures they might prefer certainly does not contribute to a clear intervention logic. It is neither proper nor democratic to ask someone who depends on the public purse for his or her survival, how much funding and under which conditions they should receive it. The complexity of modern agricultural policy, as reflected in the European Commission’s proposal, requires multi-disciplinarity, good analytical bases, creative solutions and, of course, a democratic exchange of views on the various options and effects of the proposals. 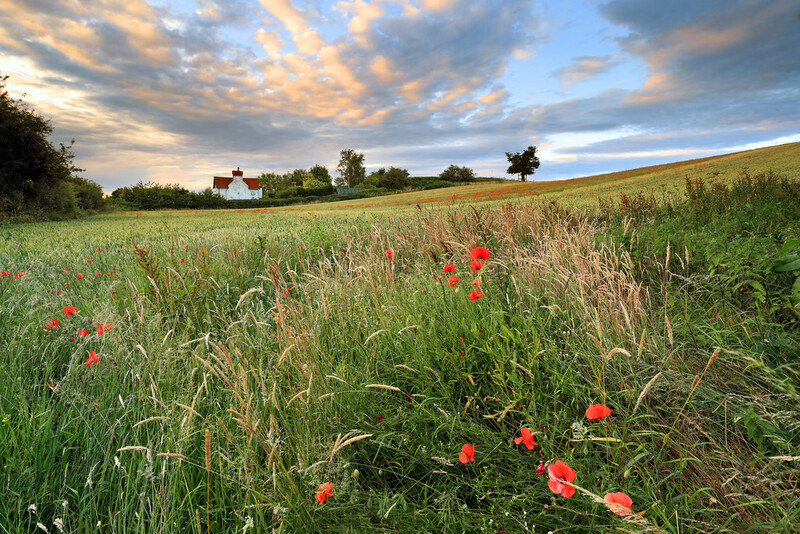 The proposal for a European Network for Agricultural Policy, which would upgrade the existing Rural Development Network, should support the exchange of opinions and democratic decision-making, but it will not in itself provide a higher quality of planning. More radical moves are needed, and above all, more investment in human resources and modes of operation of the responsible ministries. As in other parts of modern society, we should rediscover “professionalism” and assign it the same, if not higher, importance as apparent “democracy”, which all too quickly becomes interest-based and populistic. In truth, probably in most Member States, civil servants are not sufficiently trained for quality strategic planning. The deficiencies also arise from the position of agricultural officials in society, inappropriate and narrow education and lack of training, poor quality of management and politicized state administrations. CAP strategic planning introduced by the European Commission exhibits many flaws and faces many limitations. Its problems range from being caught in the logic of past measures, weak evidence bases, fixed shares allocated to specific purposes, lack of innovation, conflicting priorities, to deficiencies in planning and implementing structures; the list goes on. Does this mean we should oppose the Commission’s proposal? No, this would be very unwise. The EU political system (unfortunately) allows for no other way of achieving changes other than through a trial-and-error process. Openly criticising policy in a constructive manner will allow us to introduce changes more easily and to achieve a more modern policy that meets society’s requirements, rather than serving smaller groups of farmers. 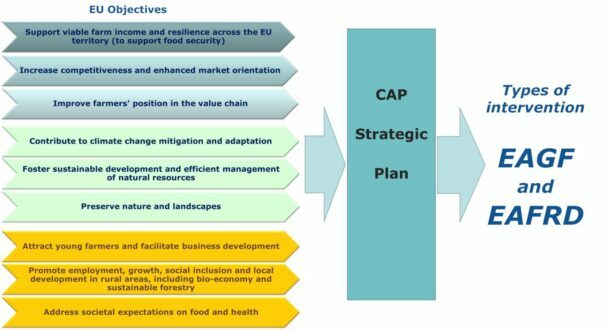 Therefore, introducing CAP strategic plans is a first, necessary, but not sufficient step towards a more efficient and effective policy. For one who believes in the EU project, a Common agricultural policy that could develop into a Food, environmental and rural policy, is a necessity. So the question is not how to get rid of this pesky strategic planning, but how to execute it better and mitigate the risks that come with its enactment. This requires serious consideration. We offer some suggestions for its improvement. The first is certainly improving evidence bases and really using them as indicators of state and of the effects of policy. This does not mean only the improvement of income and environmental indicators, but also of those pertaining to social issues (e.g., indicators for rural poverty, quality of knowledge creation and transfers), where the data framework is relatively poor and incomplete. These indicators should also be given a much higher level of importance, like macro-economic indicators, which are used in public debates and are the basis of decision-making. Naturally, this is a long road, but we should embark upon it as soon as possible, and force policy to address them. Secondly, more innovation should be allowed in designing measures. The current system is restrictive: states can only choose measures and adapt them; some measures are compulsory. In a way, this is understandable and intended to prevent renationalisation of policies and to achieve environmental goals. On the other hand, it limits strategic planning and flexibility of MSs in adapting to their situations. In an appropriate framework, proposals could be bolder and allow for innovative concepts (e.g. cooperation for addressing environmental issues or for strengthening agri-food chains). The crucial constraint here is income policy, which is frozen into per-area payment thinking. Thirdly, quality of functioning demands substantially more work with staff, institutions and decision-making structures. Being from a New MS, I have had the insight of personally witnessing the strengthening of the administration through training and twinning, and even of the quality of high-level politicians, in the pre-accession period. All this more or less stopped after accession, and the process of European integration, as well as the improvement of administration, has been halted. There are trainings, workshops, exchanges etc., but apparently they are not enough; they should be strengthened and improved. It is encouraging that Commissioner Hogan announced several times that the Commission intends to fund the preparation of the Strategic Plans and to provide technical assistance to this end. This touches upon the fourth issue, i.e. better strategic planning at the EU level. Approving, monitoring and evaluating programmes demands highly qualified, professional and cross-disciplinary staff. Without belittling their important contribution, I believe that this goes beyond the purview of the competent desk officers, who have so far been an important, if not the key, element in assessing Rural Development Programmes. The Commission also needs to raise the level and quality of operation. Is it really so unacceptable to formally invite independent assessors from outside official structures as referees? Strengthening the internal and external think-tank apparatus is a prerequisite for better governance with strategic planning. We conclude that the introduction of strategic planning presents a special challenge for both agricultural economists and other professional profiles (from both natural and social sciences) engaged in this kind of work. If strategic planning is and should be the way forward in agricultural policy, it should be included in university education. A system of specialist training should be developed. Support should be offered to institutions at both the national and Union level that will intensively work on data sources, evaluation, impact assessment and other forms of analytical support to planning. In truth, these institutions and human resources are seriously lacking at both levels and this probably also represents a threat to the success of (the attempt at) strategic planning. If the Commission’s proposals speak of necessary investment into knowledge, this also includes skills and capacities that can support quality CAP strategic planning in the future. Update 23 June 2018. The slides accompanying this presentation can be downloaded.